Lately I have been thinking a lot about the relationship of the viewer to my pieces. In this particular series I am concerned with scale and how that relationship changes when the scale has changed. This is the other end of the scale spectrum. Ideally, the viewer would be able to directly, physically interact with this work. 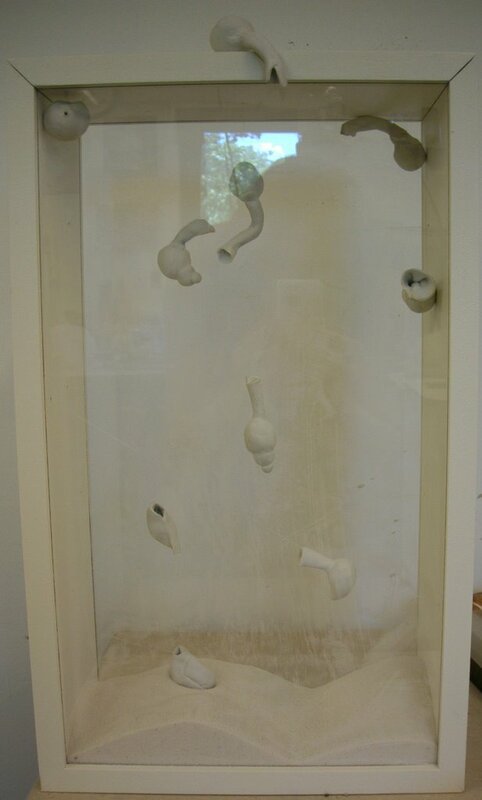 Again, I would like to have an element of discovery with these pieces as well, by placing them in a wooded area so the viewer literally discovers them. Then, they can have an isolated moment with the piece, and essentially become part of the piece. This piece focuses on the detail that can be contained in a piece that is around an inch high and how close the viewer must stand in order to see the detail. I want the viewer to see detail and form that they would normally pass over and I feel that the presentation of the pieces does this. These box pieces are like creating little worlds to me. 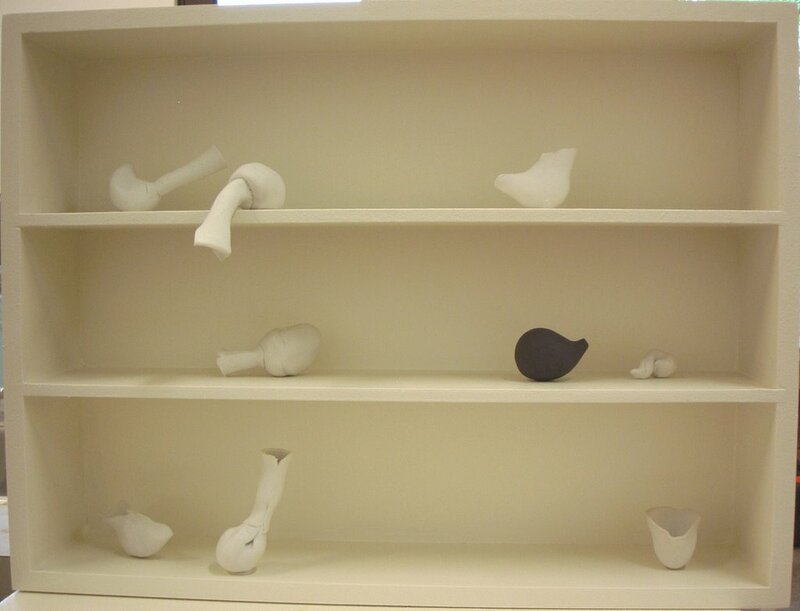 I am interested in the life like quality that these tiny porcelain pieces have and how they begin to interact when placed within the same vicinity. Relationships have interested me for a long while, and this is another way to explore them. There is also an element of mystery and discovery in these works that I enjoy. I want the viewer to feel as if they are coming upon something that is precious. In these works, I want to convey the essence of the idea that I am representing. It isn’t necessary that the exact relationships that I draw inspiration from are conveyed, but rather the feelings or senses that come along with them. In order to facilitate that, I use colors that I associate with the aura of the relationship in the piece. By using stains combined with terra sigillata, I am able to create the soft tones that I want along with a smooth semi-gloss surface. I want the surface to be tactile and inviting, so the viewer will want to touch and interact. Ideally, the pieces would be held and moved by the viewer so that they become part of the relationship and part of the piece. Click here to see work from 2004.